Hong Kong, China, Mar 12, 2019 / 03:39 am (CNA).- The Vatican’s deal with China on the appointment of bishops has not changed the government’s abuse of Catholics and sets a bad precedent for government interference with other religions, including Tibetan Buddhism, said the U.S. ambassador-at-large for International Religious Freedom. “Since this provisional deal was announced last year, the Chinese government’s abuse of members of Catholic communities has continued. We see no signs that will change in the near future,” Ambassador Sam Brownback said in March 8 remarks to the Foreign Correspondents Club in Hong Kong, China. His speech was part of a two-day forum on religious freedom, jointly sponsored by Taiwan and the U.S., Agence France Presse reports. Authorities in Henan province have banned anyone under 18 from going into church to attend Mass, he said. Throughout China in the last year, government officials have forcibly closed hundreds of unregistered churches, both Protestant house churches and “underground” Catholic communities, Brownback said. He added that officials in Zhejiang province are destroying crosses and churches and pressuring Christians to renounce their faith. Dozens of Catholic bishop positions are unfilled at present. In September the Catholic Church reached a provisional agreement with the Chinese government regarding bishop appointments that reportedly allows the Chinese Catholic Patriotic Association to choose a slate of nominees for bishop. “Therefore, the power to select the leaders of the Catholic Church in China rests partially with the Chinese Communist Party, which likely results in only individuals whom the Party deems loyal to its interests being put forth to the Vatican,” Brownback said. “Members of the Catholic community, such as Hong Kong’s Cardinal Joseph Zen, who members of the audience here know, courageously and vehemently opposed this deal,” said the ambassador. 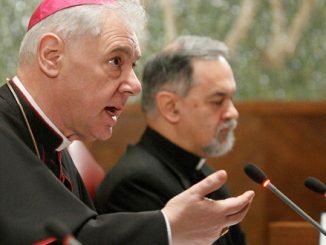 Cardinal Fernando Filoni, prefect of the Congregation for the Evangelization of Peoples, has rejected any depiction of the deal as a “unilateral sacrifice” that demands nothing of leaders long associated with China’s official Catholic organization. “It is not about establishing who wins or who loses, who is right or wrong,” he told the Vatican newspaper L’Osservatore Romano, voicing hope that he would not hear of local situations where Chinese officials exploit the agreement to go beyond its terms. “We remain concerned about the precedent this deal sets for the Chinese Communist Party’s perceived authority in interfering in the selection of other religious leaders, such as preeminent Tibetan Buddhist lamas like His Holiness the Dalai Lama,” said Brownback. The Chinese government’s interference in the succession of Tibetan spiritual leaders includes its 1995 abduction of the 11th Panchen Lama, then six years old, and his parents. It is unknown whether he is still alive. “The international community must make clear now that we believe that members of the Tibetan communities, like members of all faith communities, should be able to select, educate, and venerate their religious leaders without government interference,” he said. Brownback cited aggressive interference in Tibetan Buddhist practices and Tibetan culture. Government restrictions on monks and lay people hinder pilgrimages. Authorities appoint communists to head monasteries and ban children from religious activities. Thousands of Buddhist monks and nuns have been evicted, and their monasteries demolished. Monks and nuns are forced to take political reeducation in state ideology and to denounce the Dalai Lama. The government bans the picture of the Dalai Lama and his teachings, and it arrests those who openly revere him, said the ambassador, who added that this record indicates China’s government will likely interfere with the selection of the next Dalai Lama. China’s government has also increased the repression of other Christians, including the detention of hundreds of members of the largest Protestant home church, Early Rain Covenant Church in Chengdu in Sichuan Province. Twelve people are still detained and their whereabouts are unknown. On Good Friday 2018, officials began to enforce a ban on online sales of the Bible. Brownback criticized efforts to control “countless” religious groups, often along ethnic lines, through “religious affairs regulations.” These, in addition to “the destruction of houses of worship, the unlawful imprisonment of religious leaders, and actions to ruthlessly silence any forms of constructive dissent,” show the Chinese government’s disregard for human dignity, the ambassador charged. China’s treatment of Uighur Muslims in the far western Xinjiang Uighur Autonomous Region also drew criticism from Brownback, who said Chinese authorities have arbitrarily detained Muslim minorities in internment camps for practices like having a beard, wearing a veil, attending religious services, observing Ramadan, or praying. Travel is restricted, and parents are not allowed to give their children common Muslim names. More than one million ethnic Muslims have been detained, according to U.N. figures. The ambassador rejected Chinese government claims that the camps are vocational training centers, charging that they are “internment camps created to wipe out the cultural and religious identity of minority communities.” Internment is often based on cultural or religious identity. Detention is indefinite, and internees are subjected to “physical and psychological torture, intense political indoctrination, and forced labor,” he charged. He also mentioned Falun Gong, saying its practitioners are detained in the thousands, with some tortured. At least 69 practitioners died in custody or due to injuries sustained in custody in 2018, the group estimated. The group has faced government action for over 20 years. Some practitioners appear to be missing. Brownback cited allegations that the Chinese government forcibly harvests organs from people imprisoned due to their faith or religious practice, including in the case of Falun Gong practitioners and Uighur Muslims. The Vatican-China agreement, signed Sept. 22, 2018, is still confidential in nature. But as one effect of the agreement, the Holy See recognized seven illicitly consecrated Chinese bishops and entrusted them with the leadership of Chinese dioceses. At the moment all of China’s bishops have recognition of both the government and the Holy See. Since the deal, no new bishops have yet been appointed to China.